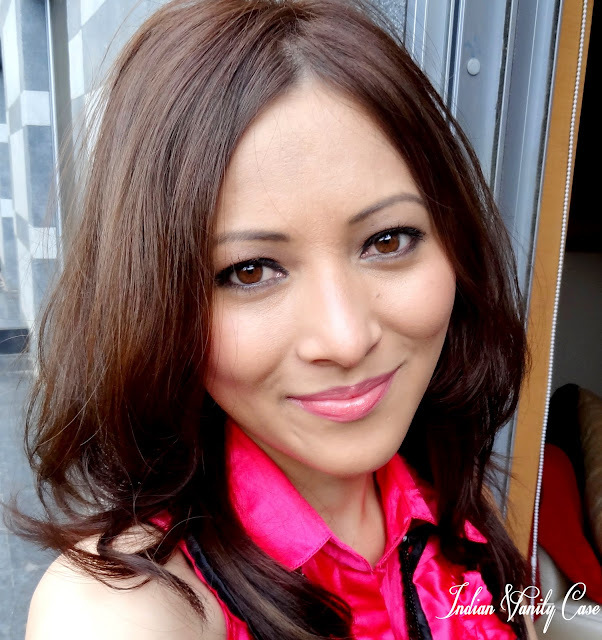 Lakmé Studio's makeup artist, Sushma, did Airbrush Makeup on me on Day 4 Lakmé Fashion Week. Above photo was after, in natural daylight. Below was backstage. I usually need a heavy concealer to conceal my dark/sun/acne spots & to conceal the pock scar on my forehead (plus special brushes & technique), but the airbrush does partly conceal most of them. If concealer is done on top & set with powder, I think skin would look close to flawless & photo-ready. I thought it was going to feel wet on my face- you know, like any liquid foundation sprayed, but it felt like air, cool air. It smelled like powder, almost like Pond's Dreamflower. It was quick. If you want to save time, it is the way to go. The finish was satin-like, kinda dewy. If you have oily & oily/combination (like mine), you'll need to set it with powder otherwise even a stand of your hair on your face would leave a streak. The coverage is medium to heavy, no concealer needed. Although, if you have very blemished skin, you might need some concealer. For those of you asking if it's best for bridal makeup: If you can find a makeup artist who has the airbrush tools, then yes go ahead. It looks really good in photographs. But though it's just about spraying and buffing (blending), it does require some skill to make it not look cakey. I will be talking about Airbrush Makeup tools & products another time. So, keep an eye out for that. its looks fab on u!! <3 hope u had a good time in mumbai..cant wait to see ur haul! It's gorgeous. Love the finish it gives, but I'm not sure how you would call that photo unflattering! i just got to know about air brush make up some days ago..when one of my friend was suggested air brush makeup on her wedding day by a makeup artist. we googled , you tubed every possible info. available on internet. she had her doubts about the finish , coverage, etc. seems like an perfect choice ! I love how your skin looks cynthia ..with this airbrush thingie!!! It looks fantastic! The airbrush makeup keeps it looking natural. You are gorgeous! Unflattering? Not at all! U look pretty even withoutnmakeup i swear! To be honest, I think you look way much better before the airbrush makeup... It looks really thick and unnatural in the 3rd picture, but you look great in the 1st one! I've seen people did it in Sephora stores, it provided full coverage indeed, but looked quite cakey and fake. Maybe the technology just isn't there yet. You know, I think that too. I prefer normal foundation for everyday. But airbrush does look good when done properly. I think the airbrush makeup looks great on you. I'm curious to know the brand of the makeup formulation. The airbrush makeup looks lovely on you Cynthia :) Can't praise enough :D But I ♥ your natural skin more..it just looks more...real..
looks so good.. love d airbrush makeup..
Hi Cynthia - Have you had a chance to checkout TEMPTU Airbrush products? Can u give me the no. Of the makeup artist. Am looking forward for my wedding.